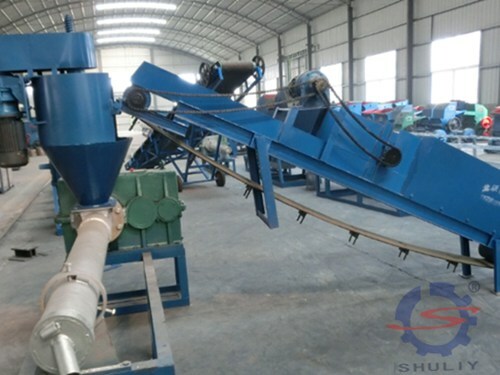 The belt climbing conveyor is an essential product in the waste plastic recycling production line. The feeding machine is used for the auxiliary machinery of the plastic granulation process. The operation process of the equipment is to transport the dried materials from the storage tank to the forced feeding machine on the granulator to save human and financial resources and protect the workers. Safety index. 1. Wide temperature range, good anti-adhesiveness, the baffle can be added, large lifting angle, easy to clean and easy to maintain. 2. The feeding machine belt adopts a new endless belt, no interface, no deviation, and is not easy to break. 3. Our feeders use custom-made plastic teeth to prevent the steel teeth from breaking into the granulator and locking. 4, used in various environments of transportation, suitable for a variety of special occasions and uses. 5. It has the characteristics of high strength, acid resistance, alkali, and salt water, and is used for transportation under various environments. 6, the factory can be customized according to customer requirements.